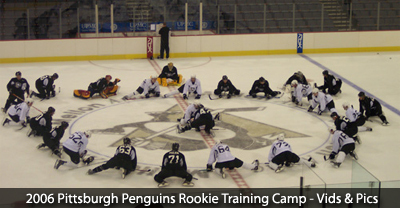 Saturday, September 9th, I attended Pens Rookie Camp so I could have my first look at the Russian prize Malkin and 2nd overall pick Jordan Staal. In attendance with myself was the rest of the Lets Go Pens Press Box (Stoosh, Jesse, Bowser, netwolf…). Besides drills and some one on ones there isnt much to report. Malkin is THAT damn good. You people need to watch out for Noah Welch. check back to this post in a few months.